Our ultrasound this morning revealed quite a surprise. Though Jeremy and I both were convinced that our baby was a girl, we were thrilled with the news that a BOY is coming our way!!! 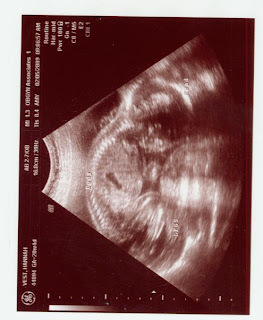 He was most cooperative with the ultrasound technician, proudly showing off his male anatomy for all to see. Weighing in at 13 ounces, the baby is healthy in every way that could be determined by today's appointment. We are so thankful to God for the gift of this child and we praise His name today and always for being so faithful to our family. A boy's name is still in the works, soon to be revealed. Titan was also thrilled with the news and even practiced being a big brother tonight with his stuffed Boston Terrier pup. (For Titan, being a good big brother was not tearing the puppy's head off - we still have lots of practicing to do). love the pictures you've posted these last two times!! Can't wait to see you! Congratulations to both of you and God be praised for a healthy little man. Can't wait to meet him. Yeah!!!! Congrats! Can't wait to meet him. Yay! Boys are a blast!! Let's go register!